I’m just so completely happy. Hatsune Miku: Project Diva Future Tone has launched via the PlayStation Network for PlayStation 4 in Japan. And it’s perfect. Related reading: Also new is Hatsune Miku: Project Diva X. Matt's import review of that game. Mind you, this is just a first impressions; I’ll have a full review up on the site in the next week or so, once I’ve had time to work through the incredible amount of content that is in this game. 220-odd tracks, 340-odd costumes for the characters, multiple difficulty levels as standard for the Miku series, and once you get to Extreme difficulty, you're going to have an existentialist crisis trying to get perfect scores. To simply play though all the music tracks once, on one difficulty setting, is an endeavour that will take you around 11 hours. To get perfect scores on each difficulty level for each track, and unlock all the costumes, and then play around with the game’s photo mode… well, if you can do that in anything less than 100 hours I will personally buy you an airplane with a Miku decal over it, for you are a true legend. But back to basics; what, exactly, is Future Tone (frankly if you’re reading Digitally Downloaded I am assuming that you know who Hatsune Miku is, but if not: click here)? 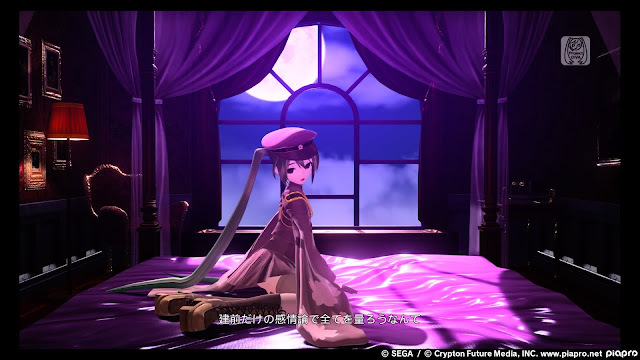 Future Tone is an arcade-perfect port of the wildly popular Miku arcade game from Japan. Now, many of the tracks from that arcade game found their way to western shores through the Miku Project Diva games, but many did not, and never have they been bundled together into a single package with the kind of graphical fidelity that Future Tone offers. See, it’s not just about playing the music tracks and trying over and over and over again to get perfect scores with Miku games. It’s about the characters and the video clips that play in the background. On the PlayStation 4, the characters have never looked better. You’re able to turn the rhythm side of the game off, and just watch each track’s video clip – which looks and behaves much like a music video clip – and take photos with a single press of a button. To be honest I end up spending as much time doing this as actually playing the rhythm game, so the massive jump up in graphical quality to the PS4 is a major feature for me. I also liked that so much of the game is unlocked from the outset, or is really easy to obtain. With the Project Diva games you’d need to go through a laborious process of unlocking songs one at a time, and then playing tracks over and over again to earn enough “points” to unlock costumes (which you had to fulfil conditions in-game first to be able to access at all). In Future Tone you just jump straight into whatever music track you want. I’m still trying to figure out where all the music is at, as I could only access 151 tracks to start, and I know there are meant to be more than 220, but even if the others are locked away for now, that’s still 150 tracks I could play from the moment I loaded the game up, and that’s mammoth. Indeed, for the first half hour I was actually paralyzed by indecision and found myself simply scrolling through the tracklist trying to figure out which one I actually wanted to play first. (Note: since writing this I have been advised that what I've likely done is simply turned on a track filter by accident. All music is apparently unlocked from the outset). Costumes, meanwhile, still need to be unlocked with points earned through play, but they’re all available in the in-game “shop” from the start, and the points costs for them are ridiculously low. The first costume I purchased for Miku was one of her bikinis (yes, I like - really like - how she looks in swimwear, deal with it), and I had enough points to do that after four tracks. Most of the other costumes are far less expensive, and can be bought after a single track, often with points to spare. This game feels like a celebration of Miku as a result. SEGA seemed to be less interested in producing a game this time around, and rather, simply dumped everything that people love about Miku and her vocaloid friends into one package for PlayStation 4 fans. The other new Miku game, Project Diva X, is almost overdone with its menus, play options, and story mode. Future Tone has four menus, and no attempt to give players anything but music tracks to play. It is very much the arcade experience. And that’s the essence of Miku. I’ve spent well over a thousand hours across the four Project Diva games to date, and within that I’d be lucky if I’ve reached 50 hours in the various non-rhythm game modes SEGA likes to throw in. Give me my Miku, my chose of costume for her, and the ability to simply watch her dance, and I’m happy. Which brings me back to me opening comment; this game is making me happy, because it is so utterly focused on why I play Miku games in the first place. Rhythm games are right up there as the most import friendly genre, and this one requires no real understanding of Japanese at all. The tutorial is in its native language, but the visual cues are enough to understand what to do, even if you haven’t played a Miku game in the past (and if you have, then you’ll already know how to play). The menu system is a little confusing at first when you want to chance a character’s costume, but a minute or two of poking around and you’ll have it figured out via trial and error. From there the language barrier fades right into the background; I can’t imagine anyone having trouble with this. The game is only available as a digital download, and the strong word is that it’s never getting localised, so thankfully the PlayStation 4 is region free, and it’s very easy to get PlayStation credit for a Japanese account from Play-Asia. Related reading: 3DS owners don't need to miss out on Miku! Project Mirai on the 3DS is wonderful too. Matt's full review. Unfortunately the realities life got in the way, and I’ve only had a couple of hours with Future Tone so far (I miss Miku!). I’ve played a dozen or so tracks, watched some video clips, bought some costumes and taken some screenshots, but I’ve barely scratched the surface of what I can do in the game. That disclaimer aside, here’s what is blatantly obvious about the game and I’m comfortable calling it now; it’s the best Miku game out there, and if you even slightly like rhythm games, then you’re doing yourself a deep disservice if you don’t pick it up.